Neil Anderson is an American musician who sings, and plays the uilleann pipes, highland bagpipes, flute and tin whistle. He has performed with the celtic rock groups Seven Nations, Full Circle, and Rathkeltair. I'm unable to find on the Net if he is still performing, but you can see and hear him on YouTube. 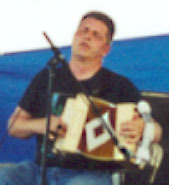 John Whelan is a great Irish-American button accordionist, who also plays solo and with various other musicians. His style of playing is very intense and infectious, joyful and warm. Iarla O Lionaird is an Irish-born sean nos singer, from West Cork. Sean nos means "old style" singing in Irish, and is ancient gaelic songs (in the Irish language), usually unaccompanied, and sometimes accompanied with uilleann pipe (or other) accompaniment. 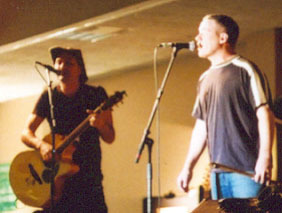 Iarla has a CD called Seven Steps to Mercy, where he performs these songs with and without accompaniment, some with contemporary instrumentation. The sound of his sean nos music is other-worldly, very spiritual, and I love it. Sean nos singers come from all parts of Ireland, however Iarla's style of singing is particular to the area of West Cork where he grew up. (My mother's family, the Lynches (O Loingsigh) came from near the same area of West Cork (Slievereagh), and that may be why I respond to it so much.) He also sings with the group Afro Celt, and they have four CD's out; they are a group of Irish-born and African musicians, who play exuberant music with interesting African rhythms. Iarla also has a soundtrack CD from the movie I Could Read the Sky, for which he composed the music. Martin Hayes and Sinead O Connor also perform on this CD, which combines traditional with very contemporary music, even edgy at times, with excerpts read from the book this film was taken from combined with the music at times. He grew up in the sparsely populated gaeltacht (Irish-speaking area) of West Cork, Ireland, and began singing in the sean nos tradition when he was very young. The sean nos tradition is an ancient one, and a very honorable profession in gaelic society. I don't have a picture of Iarla (yet). This is my fan page for Neil Anderson, John Whelan and Iarla O Lionaird. Check out the Clan na Gael Reunion Tour 2005! 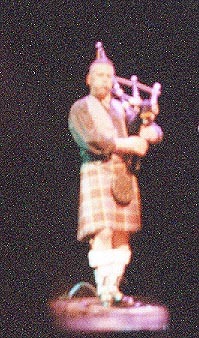 The uilleann pipe (pictured above) is the Irish bagpipe. In Irish, the word 'uilleann' means elbow - the uilleann pipe is attached at the elbow, and is bellows-driven, rather than blown into (like the highland bagpipe). 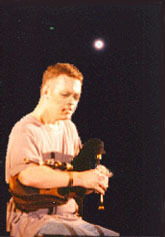 Some uilleann pipes are larger than the one Neil uses, with a long pipe attached, like the one Davy Spillane plays (he performed an uilleann pipe solo in the Dublin production of Riverdance). Neil plays with a lot of heart - The Washington Times called him the "Jimi Hendrix of the highland bagpipe." 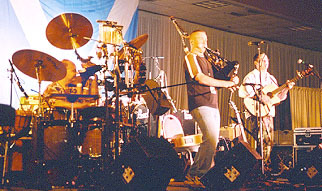 Right and below are Neil at the Scottish & Irish Music Festival in King of Prussia, Pennsylvania, playing in the band Rathkeltair.